With the blessing of His Grace Bishop Irinej, on Saturday, July 28th, twenty-three Orthodox pilgrims from St. George Serbian Orthodox Church in North Canton, Ohio embarked on a spiritual journey to the ancestral homeland of their Serbian Orthodox church. Their journey began on Sunday morning where the pilgrims gathered with their guide, Jelena Miloradovic, in the crypt beneath the Temple of St. Sava on Vracar. This church beneath the temple was frescoed in glorious gold and bright colors, with the life of the chapel’s namesake - Tsar Lazar of Kosovo - depicted in iconographic form opposite the iconostasis. It was a beautiful service filled with a tapestry of faithful from young to old, including many young adults, joining together in thanksgiving. 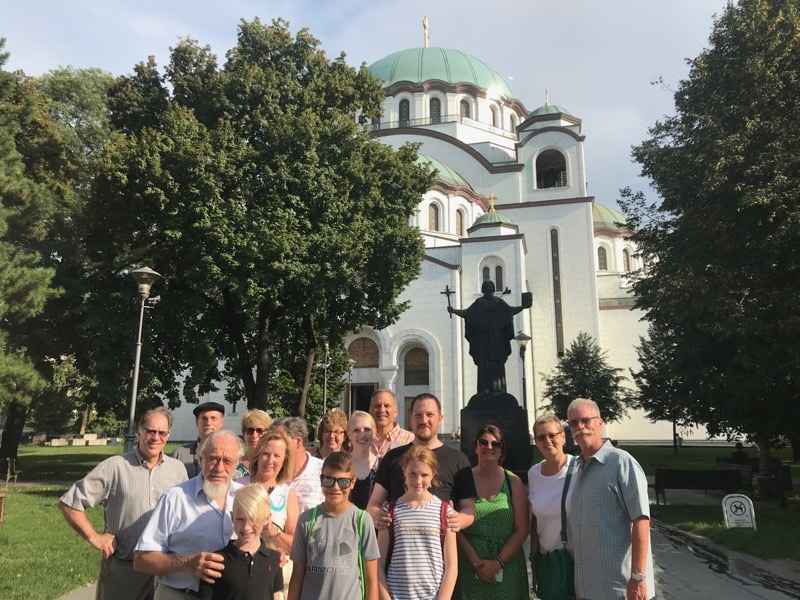 Immediately following Divine Liturgy, the pilgrims journeyed through Belgrade enjoying the cosmopolitan sites, as well as the many beautiful churches. In particular, the pilgrims enjoyed the Saborna Crkva, Ruzica Church, and Chapel of Sveta Petka. The following day the pilgrims journeyed to Zica Monastery, built by the decree of St. Stevan the First-Crowned and his brother, St. Sava the first-enthroned hierarch of the Serbian Church. The faithful lit candles and prayed in this 13th century architectural masterpiece, before continuing on to Studenica monastery where they stayed for the evening. As storms rolled through the hills that night, the faithful were lulled to sleep to the steady drumbeat of raindrops and the occasional crash of lightning. In the morning, at 6:30am, the pilgrims arose for Divine Liturgy concelebrated by Fr. Aleksa Pavichevich. The group enjoyed the hospitality of the monastic community with coffee and conversation in the konak, where they met a couple from the Netherlands, Johan and Ankita, making their own pilgrimage to Studenica and Decani. The two had visited many years ago, hearing of the holiness of the Serbian monastic communities, and now make routine visits driving from their native land. Later that day was one of the highlights of the trip as the pilgrims visited Djordjevi Stupovi. They climbed the hill leading to this beautiful monastery in time to join the Vespers service, celebrated by the Abbot, Fr. Gerasim. In a tremendous display of Christian hospitality, Fr. Gerasim invited all the faithful to enjoy refreshments and conversation. Fr. Gerasim immediately made friends with the youngest pilgrims, teaching the children, Ben Foltz and Lazar Pavichevich, to serve coffee and beverages to the group. He then brought the children instruments to play, and rejoiced as the third child on the trip, Sophia Pavichevich, sang the Resurrectional Troparion in tone one for everyone, and then danced a kolo with her brother, Lazar, at Fr. Gerasim’s request. It was, for the trip’s young people, a highlight of their journey. The following day, the pilgrimage continued into Kosovo and Metohija where the pilgrims experienced, for the first time, the reality of life for the Orthodox faithful of this holy land. After a long journey south, the pilgrims were able to offer their prayers at Decani monastery, as they weaved through a road fraught with stone-blockers, guards, and fences. With a new understanding of the plight of the faithful in Kosovo, they prayerfully entered the monastery and venerated the relics of St. Stevan of Decani. As had become customary for the pilgrims, they were once again greeted with love and hospitality by the monastic community. While rain began to fall, the pilgrims gathered on the portico and delighted by refreshments, and conversation with members of the monastery. The children were encouraged to play and stretch their legs to the delight of everyone. The pilgrims finished their day by visiting the Patriarchate of Pec, lighting candles, and joining for an evening Vespers service. In the evening, the pilgrims experienced the best of Serbian hospitality as they were greeted with bread and salt as they arrived at Hotel Konstantin, before enjoying a magnificent feast and a traditional folklore performance. The spirit of the people was strong and loving, even as they stand surrounded by hostility in their native land. The following day, the pilgrims began with Divine Liturgy at the Monastery of the Holy Archangels where, once again, they were treated to hospitality and an unexpected meal. Together with the small group of Orthodox faithful that still exist in the area surrounding the city of Prizren, they prayed, conversed, and broke bread. During the rest of the day, the pilgrims walked from church to church in Prizren. The faithful priests of those holy churches talked joyfully with the group, and shared the challenges of life in Prizren while they minister to a group of less than 35 Serbian people who have not been driven from their home. The priests in Prizren were exemplary models of faith and service. Despite the many challenges of daily living in such a tense and hostile environment, they maintain good spirits, always trusting in God for all things. The faith of the Serbian people in Kosovo and Metohija was truly inspirational! The pilgrims finished their time in Prizren with a visit to the Seminary where, currently, fifty-five students are learning to serve in Christ’s Holy Church. That afternoon, the pilgrims went to the village of Velika Hoca where a feast was prepared at a local vineyard, “Vinica Petrovic”. Once again, the pilgrims were awe-struck at the beauty and depth of faith in this little Serbian village where the people stayed, despite the threat and oppression that surrounds them. The last day in Kosovo and Metohija, the pilgrims went to Gracanica Monastery before visiting Gazemistan, the memorial at the field of the battle of Kosovo. It was at this place where the pilgrims heard Fr. Aleksa, and their guide Jelena, recount the tale of this battle and its significance in European history as well as the culture and spirituality of the Serbian people. As the pilgrims departed for the north, it was an emotionally difficult time as they reflected on the beautiful faith of the people in Kosovo and Metohija, and the challenging circumstances in which they live. The people of this region will forever be in their prayers, and the parish has committed to return to the region once again to continue to support those Serbian faithful who remain in that holy land. 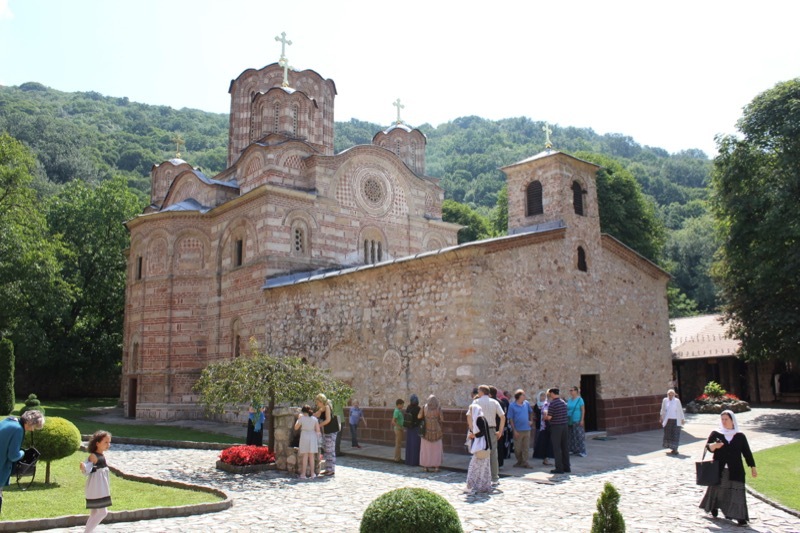 During the final days of the trip, the pilgrims visited many monasteries as they continued their trip back to Belgrade. At Ravanica Monastery, the trip’s youngest participant, Lazar Pavichevich, was able to venerate the holy relics of Tsar Lazar of Kosovo. In full prostration, he prayed for the Saint’s holy intercession not only for them, but for those faithful still in Kosovo and Metohija today. A little later, while visiting Manasija Monastery, the pilgrims received word that the Lilian Tumbas, aunt of pilgrim Mark Tumbas, passed away back in the United States. In a sign of loving support for their fellow pilgrim, the group gathered for a small memorial prayer together. On the final day, the faithful departed for Novi Sad, where the pilgrims visited the cathedral church before walking up the hill to the fortress at Petrovaradin. While overlooking the Danube, and the dazzling landscape, they enjoyed a lunch and a time of peaceful reflection. They were saddened as their journey was coming to end, but rejoiced at the spiritual growth they experienced throughout the Serbian lands. That evening they broke bread at “Dva Jelena” on Skadarlija in Belgrade. The pilgrims feasted together as they listened to traditional songs played live at their table. It was a time of thanksgiving, as they expressed their love and gratitude for the so many amazing experiences over the previous ten days. They were thankful that their Hierarch, His Grace Bishop Irinej, blessed their pilgrimage to take place; they were thankful to God for their safe journey; they were thankful for the hospitality of the Serbian people; they were thankful for the inspiring faith of the Serbian peoples in Kosovo and Metohija; and they were thankful for the hardships they endured on what was a true, spiritual journey through the Serbian lands. They all raised their glasses together, in the midst of the lively restaurant, and offered further thanksgiving as they toasted those who had journeyed with them from Dobrocinstvo - Vladan Seferovic, who worked tirelessly on behalf of the group; Jelena Miloradovic, whose knowledge of Serbian art, history, and architecture were unparalleled, and who radiated her true Orthodox faith every day; and their driver, Dejan Miletic, who, in faith and good spirit, took the pilgrims safely throughout the land.